- Silicon free, SO'BiO étic Organic Lip Liner is enriched with organic argane powder, shea butter and bees wax for a more comfortable application. 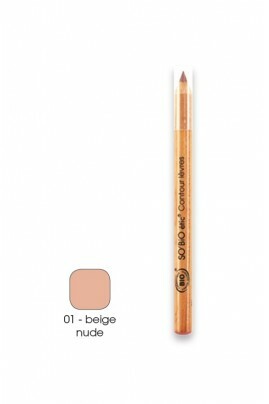 Line your lips contour with SO'BiO étic Organic Lip Liner before applying the lipstick or lip gloss of your choice. Watch this lip liner in the video tutorial "Smokey Eyes Mordoré". Hydrogenated Palm Oil, Hydrogenated Coco-glycerides, Cetyl Laurate, Cera alba (Beeswax)*, Talc, Butyrospermum Parkii (Shea) Butter*, Argania Spinosa Shell Powder*, Caprylic/Capric Triglyceride, Trihydroxystearin, Bisabolol , Tocopherol. May contain: CI 77491 (iron oxides), CI 77499 (iron oxides), CI 77492 (iron oxides), CI 77891(titanium dioxide), CI 77742 (manganese violet), Mica.